Amman, Jordan: Chocolate cafe chain, dipndip, announced today the opening of its first outlet in Jordan bringing the total number of dipndip cafes globally to 102. With its entry into the Jordanian chocolate market, dipndip now operates in 17 countries as demand for premium chocolate and desserts in these markets soars. According to market analysts, the Middle East chocolate market is estimated to grow at a compound annual growth rate of about 4.8 percent by 2023. This will mainly be driven by a change in eating preferences, health benefits, and rising consumer spending. Speaking during the official opening of the new cafe located in Amman’s Al Abdadi boulevard, dipndip spokesperson said that chocolate cafe’s debut into the Jordan chocolate market was largely driven by an increasing demand for the dipndip chocolate experience in the country. “We are delighted to have finally brought the dipndip experience to Jordan – a dessert experience most Jordanians are familiar with having had an opportunity to sample in other cafes across the region. We intend to re-energize the Jordanian chocolate market through our one-of-a-kind menu, which offers treats that our customers have become accustomed to over the years.” said Emad Tinawi, dipndip chief executive officer. The Jordan outlet is part of the chocolate cafe’s expansion drive aimed at cushioning a ballooning appetite for chocolate desserts among Middle East consumers. dipndip plans to tap into the country’s rich history, culture and heritage, strong local market and its tourists who flock the country from all over the region. As part of its expansion plan, dipndip also unveiled its new offering, which includes a first-of-its-kind breakfast menu filled with new and exciting savory items. The new menu also features new signature drinks and a revamped gelato ice cream, which is freshly made daily in-house. The new menu will be available across the dipndip network with special tweaks to cater for the respective local tastes. As a new entrant in the market, dipndip is poised to disrupt the largely fragmented market as it seeks to boost the country’s snacking culture by introducing a new form of holistic chocolaty experience. In its quest to grow its footprint, dipndip is also in the process of setting up shop in key markets including the United States of America, Canada, and Indonesia where it plans to set up its Asian regional office. According to Emad, dipndip’s continued expansion spree has also been fueled by the cafe’s growing popularity of its exclusive mouthwatering Belgian chocolate masterpieces and brand experience. This, he says, has seen the cafe grow from 24 outlets at the end of 2014 to the current 102. By the end of the year, dipndip plans to expand its network to 148 cafes by opening 46 new cafes in 2018.
dipndip was created with a vision, to make people smile through their one of a kind desserts and chocolate experiences. And not just any chocolate – premium chocolate desserts that are so unique that they make people’s faces lit up with excitement. dipndip’s sweet journey kicked off in 2009 with the very first location being a small kiosk which soon became a market sensation. In 2012, after a successful launch and run through the years, dipndip launched and rolled out its franchise model from an idea mooted after numerous enquiries from several investors across the MENA region. Years later, dipndip transformed into a global franchise and continues to accelerate its growth. 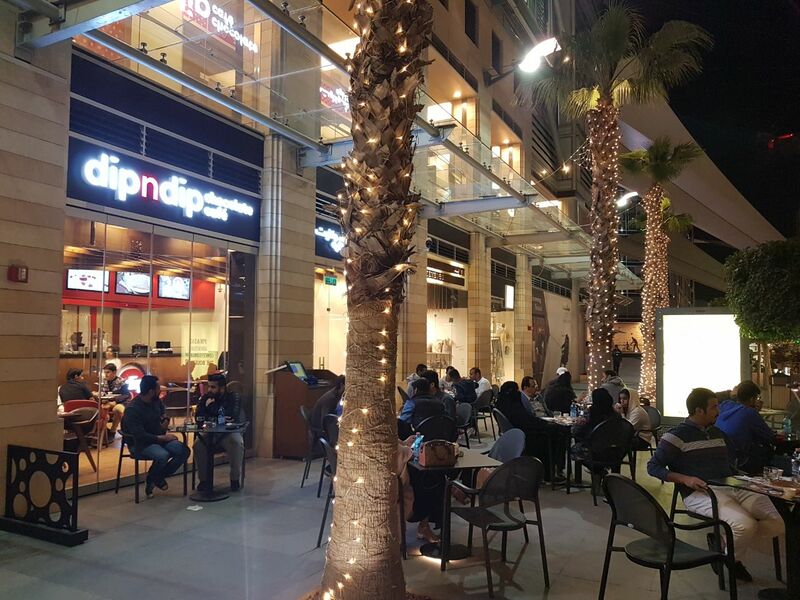 In 2017 dipndip reached a milestone by launching its 100th cafe, which is in City Mall, Lebanon. It has managed to reach this milestone almost twice as fast as than any other global franchise such as Mcdonald’s (19 years), Dominos (15 years) and Dunkin Donuts (15 years). Moreover, dipndip has expanded across the entire globe in 16 countries covering the Middle East, North Africa, Eastern Europe, and Asia, and Latin America regions. These countries include, Armenia (with 1 cafe), Bahrain (2), Egypt (6), Ivory Coast (2), Kazakhstan (2), KSA (29), Kuwait (11), Lebanon (14), Malaysia (6), Morocco (2), Oman (3), Panama (2), Qatar (4), Syria (3), Turkey (2), and the UAE (6). Mid-East.info (MEi) is a daily updated online business news publisher, covering the greater Middle East region. We publish news, articles, reports and other forms of content for those who are interested in business news and information from the Middle East.